He didn’t understand since when his life was not important. The sound of the shots and shelling echoed in his heart. “Life is the most important thing” _ he had always listened, but how to keep himself safe? Being hidden under a car, blood drops splashed in his face. Cries of fear made him close his eyes for a while. Then, the silence…it seems that everything had gotten back to normal. But he feels that a pair of hands take him out of the car. They are his parents that carry him in their arms, running and covering his face. He is hardly eight years old! Suddenly, he finds himself being put into a small boat, floating in deep frozen waters. He is very cold and he is only wrapped with a thin blanket. 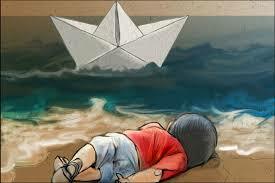 His parents fleeing from war with many other people are sailing towards any other country seeking asylum. “If dreams feed the soul, I will dream about going to school every morning… someday! _ he thought and then he felt asleep.